I think the lighting was great and it's a very nice subject; however, I'm in agreement that if the 10 had been in focus you might have received a better score. I do like the focus on the girl's face, the way her bangs are so sharp, but maybe if she had been closer to the plane that the candles were on to keep the '10' in focus it would have improved your scores. However, outside of the challenge I would have preferred the focus you chose instead. 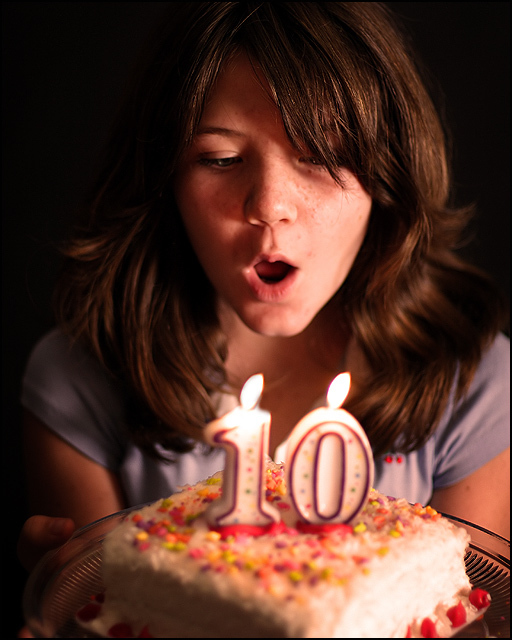 This was a great concept for the challenge, but I think the 10 needs to be emphasised by putting the focus on the candles, and leaving the girl's face blurred. Maybe a lower angle too, to give more prominence to the "10" candles. And maybe the lighting could have been a bit stronger - like getting the whole cake lit, rather than just having a light off to one side. I'm not really sure what to think on this one..... I like the idea, the girl's face is great with the glow from the candle. but the cake Is out of place somehow I can't put my finger on it. If it was black and white it would be perfect. Proudly hosted by Sargasso Networks. Current Server Time: 04/21/2019 12:07:17 PM EDT.